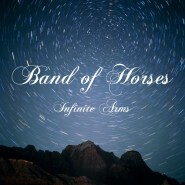 Band of Hors­es released its third album, Infi­nite Arms, ear­li­er this week. Their first under the Colum­bia label, Infi­nite Arms is a diverse, unique, and sur­pris­ing­ly unsat­is­fac­to­ry album. Cer­tain­ly not the band’s best work, one can only hope that in the future, Band of Hors­es puts a good deal more thought into each track, rather than just think­ing of the album as a whole. Despite the wide vari­ety of instru­ments used by Band of Hors­es (any­thing from gui­tar to theremin), tracks on Infi­nite Arms are just not that inter­est­ing. In gen­er­al, the pat­tern, for both melodies and accom­pa­ny­ing parts, seems to be to choose extreme­ly sim­ple lines to repeat for the entire track, and then bare­ly, if ever, devi­ate from that point. Not only is this entire­ly unin­ter­est­ing, in many cas­es, the instru­ments sim­ply do not work with one anoth­er (most obvi­ous­ly on “Fac­to­ry”). There are some instances where tracks devel­op some­what from begin­ning to end, includ­ing “Way Back Home,” and these tracks unsur­pris­ing­ly turn out sig­nif­i­cant­ly bet­ter than the rest, but the pres­ence of such tracks is severe­ly lim­it­ed. Ben Bridwell’s vocals are most like­ly meant to sound ener­getic and just the slight­est bit ethe­re­al, for a well-formed con­trast with the instru­men­tals. Unfor­tu­nate­ly, they miss that mark by a good bit. Instead, Bridwell’s voice tends to sound thor­ough­ly ordi­nary - that incred­i­bly gener­ic mix­ture of rock and folk vocals that does lit­tle more than let you know it’s there. A slight whine is the only dis­tin­guish­ing ele­ment, and it’s not the pos­i­tive sort of dis­tin­guish­ment. On top of that, Brid­well nev­er leaves the pat­tern that his voice has fall­en into by the end of the first track. Instead, he falls into a set of unin­ter­est­ing ebbs and flows that do very lit­tle for the album. Lyri­cal­ly, Infi­nite Arms runs the gamut between mun­dane and bizarre. While “No one is ever gonna love you more than I do” isn’t exact­ly unique, “I had a dream / That I was your neigh­bor / About to give birth” is. Unfor­tu­nate­ly, it’s not the sort of unique­ness that would demon­strate pro­found cre­ativ­i­ty on the part of Band of Hors­es. Rather, it’s the sort that indi­cates that the band’s replaced cre­ativ­i­ty with inani­ty. Though that’s only one of quite a few sec­tions that dis­play such lyri­cal fail­ings, it’s a good exam­ple of how lit­tle sense much of Infi­nite Arms makes. Com­ple­ments must, in all fair­ness, be giv­en to cer­tain aspects of the album as a whole. Though lit­tle thought was evi­dent­ly put into craft­ing each track, Infi­nite Arms was well designed. Each track is quite unique, impart­ing a healthy lev­el of diver­si­ty to the album. Unfor­tu­nate­ly, giv­en Infi­nite Arms’s fail­ings, the most that can be said is that if each track were not soporif­ic, the album as a whole would cer­tain­ly not have been. To put it sim­ply - Infi­nite Arms does noth­ing espe­cial­ly well. It com­bines unin­spired instru­men­tals, alter­nate­ly irri­tat­ing and dull vocals, and absolute­ly non­sen­si­cal lyrics to come up with some­thing that is, while not quite ter­ri­ble, cer­tain­ly not good. Though Band of Hors­es’ ear­li­er work hasn’t been exact­ly rev­o­lu­tion­ary (thanks large­ly to many of these same prob­lems), Infi­nite Arms is cer­tain­ly a step down from the band’s last two albums. Per­haps the group’s fourth album will be tru­ly inter­est­ing - but we’re not hold­ing our breath.